Bahia grass is a popular, low-maintenance grass for warm climates in low-traffic areas. It forms an extensive root system with good drought tolerance, but requires frequent mowing to prevent tall seed heads from forming. Bahia grass can be planted from seed, sod or plugs. 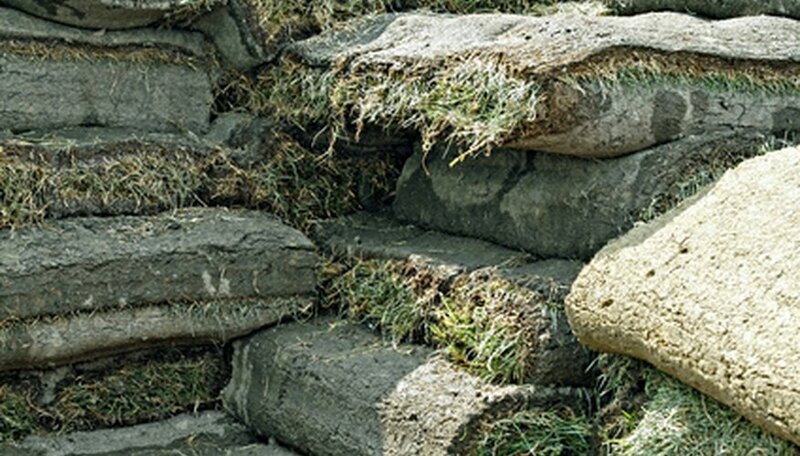 Installing sod helps quickly establish the law and hold back weeds. Seed and plugs are slow to establish and require constant weed control. Measure the lawn width and length. Multiply these two numbers to find the square footage needed to cover the lawn. You should have extra bahia sod to allow for a little waste. Pull weeds from the site. Use a rake to remove large rocks and loosen the soil. Spread 1 lb. of a balanced fertilizer per 1,000 square feet, using a spreader, and rake it into the soil the day before planting. Thoroughly water the soil. Lay the bahia sod as soon as possible after delivery. Water the soil again lightly, if needed, to moisten it before placing the sod. Start by placing the sod along a straight edge. Move each row over to create a brick pattern, placing the edges as close together as possible. Cut pieces to fit as close as possible around trees or landscaping beds. Use a roller to lightly press in the sod and smooth the surface. Avoid walking on the new grass. Water the Bahia sod as soon as possible after laying, using sprinklers or a garden hose. When laying a large area, water each section as you go. Water twice a day for the first two weeks, more frequently in hot dry weather. Then, slowly spread out the period between watering, allowing the grass to wilt slightly before watering. Apply 3/4 to 1 inch of water each time. Do not overwater bahia grass. Lay bahia grass sod in the spring to allow the roots time to establish before winter. Do not mow bahia grass sod until the roots are established.